Learn how to make smoothies. Your step by step smoothie handbook. You can learn how to make smoothies with your own blender. I have complete faith in you. All you need is a few pointers to get you running in the right direction on smoothie basics. As you search the web or cookbooks for smoothie recipes, you might be disappointed at the lack of nutrient dense smoothie recipes available to you. You do not need to use syrup and frozen yogurt to make a smoothie taste good. If you use ripe fruits, tons of sugar shouldn’t be needed. If you use a lot of refined sugars, that smoothie would not fall into the “healthy” category. Your body craves certain nutrients that cheap man-made sweeteners will not give it. So you will be searching the refrigerator for more munchies not long after eating. You can use many different types of ingredients for the base of your smoothie. You can even blend up some healthy vegan drink recipes without heavy cream or fruit flavored syrup. If you want to learn how to make smoothies correctly, you must understand that smoothies need a base. A base creates a creamy texture for the smoothie. It is the “body” of the smoothie, so to speak. Liquid is extremely important. If you pour too much, your smoothie will be very thin. The desired flavor guides the choice of liquid that you need. The average amounts used for a smoothie is 1 to 2 cups of liquid. Learn how to make smoothies with the list of fruits below. Or try new and exotic fruits to mix it up! For example, mangos are usually blended with pineapple. But they actually taste great with berries. Have fun making tasty smoothie recipes. You can even be creative and name your new masterpiece. 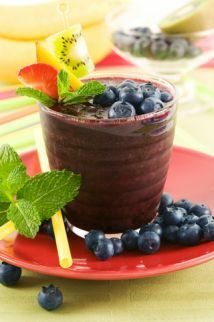 Acai Berry - Create acai berry smoothies and enjoy acai berry benefits! Apples - An apple smoothie recipe is a tasty way to pack in that beneficial fiber into your diet. Remember... An apple a day, will keep the doctor away. Avocados - Try blending an avocado smoothie recipe to gain the complete benefits of avocados and to absorb more nutrients from your food. Bananas - Blend creamy banana smoothies with this highly used smoothie fruit. Check out some interesting banana nutrition facts. Blackberries - Blackberry smoothie Recipes have a wonderful flavor of their own. Sweet and zesty at the same time. Blueberries - Check out these blueberry smoothie recipes and see why blueberries are a favorite in my household. Not only do these little berries taste great, they are packed with blueberry nutrition. Cherries - Cherry smoothie recipes can add a delightful twist to any day. You can even snack on the frozen cherries to cool down on a hot day. Grapes - Use this sweet and juicy fruit to create naturally yummy grape smoothie recipes! Lemons - Lemon smoothie recipes definitely need their own page. These smoothie recipes are zesty but with a sweet aftertaste. Simply delightful! Plus, you get the the benefits of detoxing with this special fruit. Mangos - Try this tropical fruit to make a delicious mango smoothie recipe. Plus, check out these mango nutrition facts. Melon - A melon smoothie is probably the most unique smoothie I've ever posted on Smoothie Handbook. Surprisingly... really yummy! Oranges - Up your vitamin C by drinking an orange smoothie recipe. See that orange nutrition is more than just the vitamin C.
Peaches - Peach smoothie recipes are a tasty treat to mix up your smoothie routine. Pears - Find some delicious pear smoothie recipes and see how you can save money by using pears in your smoothies. Pineapple - Refresh yourself with a healthy pina colada smoothie recipe. Find out how to pick the best pineapple and learn more about pineapple nutrition. Pomegranate - Increase your antioxidant intake with pomegranate recipes and smoothies. You will receive great benefits from pomegranate nutrition. Pumpkin - You don't have to enjoy pumpkin just one month of the year. Celebrate the holidays all year long with these pumpkin smoothie recipes! Raspberries - Add some zest into your life with a raspberry smoothie. See the incredible benefits of raspberry nutrition. Strawberries - A strawberry smoothie recipe is the most popular fruit smoothie known to man. Good thing too... Because you get tons of strawberry nutrition with very low calories. Watermelon - Need a recipe for watermelon smoothie? Here you go... Enjoy! Astragalus - Discover how to boost the immune system with astragalus in tasty smoothies. Beans - Bean smoothies are a great way to curb those cravings and lose weight! Chia Seeds - Check out how chia seed recipes can benefit you. Flaxseed - a great way to add calories to gain weight fast! Greens - Got Greens? See how convenient it is to get a whole meal's worth of nutrition in one green smoothie! Maca - Add antioxidants into your diet with maca root. Psyllium Husk Powder - Lose weight and scrub your colon clean with psyllium fiber. Sprouts - Learn how to successfully grow sprouts every time. Wheatgrass Juice - Easily increase the nutrient density of your smoothie with wheatgrass juice. Chocolate - Yes, you can make a delicious creamy chocolate smoothie recipe without refined sugar and ice cream! Yum! You can choose your chocolate smoothie base: coconut, nuts, beans, oatmeal, and even sugar-free! Cinnamon - A smoothie is a great way to not only enjoy the flavor of cinnamon, but also get the health benefits as a cinnamon supplement. Coffee - You don't have to pay high prices for those coffee smoothie recipes. Make your own yummy homemade frappuccino. Eggnog - Enjoy your nutmeg and cinnamon in a delicious eggnog smoothie. Peanut Butter Peanut Butter Smoothie Recipes - Be creative... Try making a PB&J Smoothie or a Peanut Butter Chocolate Smoothie. Yum! Peppermint - There is nothing quite like the refreshing flavor of chocolate with a twist of peppermint in a festive chocolate peppermint smoothie. Sugar Substitutes - Try out some great sugar substitutes that will not give those horrible sugar side effects! Vanilla - Not many other things smell better than fresh vanilla bean. A vanilla smoothie recipe is simple, but yet tastes out of this world. Yogurt - Get healthy flora for your intestines all while enjoying a yogurt smoothie recipe!